Nearly every Texas Democrat in the U.S. House contributed in their own way Wednesday to an effort that ground the chamber to a halt with the aim of forcing a vote on gun control legislation. WASHINGTON — The U.S. House of Representatives broke into chaos Wednesday as House Democrats essentially took control over the chamber — but not the body itself — in a push for stricter gun legislation. "Where is the morality of this place?" asked U.S. Rep. Sheila Jackson Lee at one point during the hourslong demonstration. Jackson Lee, a Houston Democrat, spent hours Wednesday sitting on the floor of the U.S. House nodding and responding to her Democratic colleagues' demands for increased gun regulation. Jackson Lee and most of her fellow Texas Democrats were part of an unconventional procedural tactic that became known as "the sit-in" on Capitol Hill. 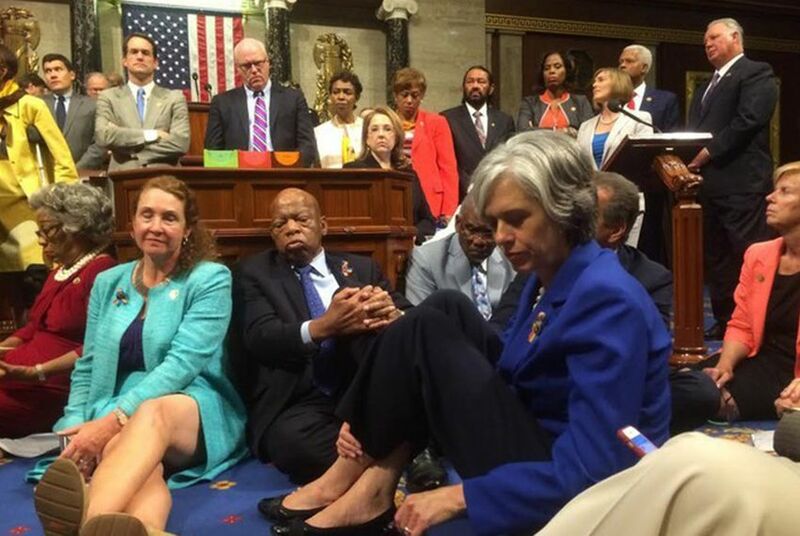 Democrats essentially overtook the chamber by literally camping out on the floor and demanding U.S. House Speaker Paul Ryan allow a vote on gun control legislation in response to a recent shooting at a gay nightclub in Orlando. Democrats of almost every pocket of the caucus took part in the collective action which brought regular business in the U.S. Congress to halt. At least one round of votes lapsed over the course of the day. Democrats were largely focused on securing votes on measures aimed at preventing suspected terrorists from buying firearms and expanding background checks. Frequently, the chamber broke into cheers of "No bill, no break!" Republicans mostly avoided the pyrotechnics. But the drama came to a head around 10 p.m. Eastern Time when Republicans assembled onto the floor for a vote over whether to override a presidential veto that did not pertain to the gun issue. U.S. Rep. Louie Gohmert of Tyler, however, engaged verbally with Florida Democratic Rep. Corrine Brown after the 10 p.m. vote. Gohmert’s Texas GOP colleague, U.S. Rep. Bill Flores, gently tried to pull him away from the confrontation. Brown, a firebrand in her own liberal corner, has district lines that cover The Pulse, the gay nightclub that was the setting of the most recent shooting massacre that set the day's political events into action. Ryan's office opted to turn the House cameras and microphones off during the event, in accordance with previously agreed-to House rules. "The official House feed has been switched off," C-SPAN, the congressional cable channel, stated on its channel and website after many viewers questioned why the network wasn't carrying the demonstration live. "C-SPAN does not control it." "I'm rising to say, Mr Speaker, turn on this microphone," Pelosi said. U.S. Rep. Beto O'Rourke, an El Paso Democrat, entered the chamber midafternoon and initially observed the action seated alone. But after many speakers decried that the chamber cameras were not turned on, he took to using his phone to transmit the event live on his Facebook page and Snapchat. At times, thousands of people on Facebook were monitoring his video. Eventually, C-SPAN opted to temporarily broadcast the feed captured by O'Rourke's phone, as well as ones from other lawmakers. "The House cannot operate without members following the rules of the institution, so the House has recessed," said Ashlee Strong, a Ryan spokeswoman. Members were still on the floor well into Thursday morning and were on track to address how to combat the Zika virus and whether to adjourn through July 5. The early adjournment would be a GOP tactic to cut off the sit-in for the rest of the week. Regardless, nerves were raw at the U.S. Capitol, and it's likely the last 18 hours will have a lasting impact on how these two parties interact going forward in the House.